First Novels Club: Review and DARKFALL Giveaway! Janice Hardy's THE HEALING WARS: The fantasy trilogy you should be reading. Review and DARKFALL Giveaway! Janice Hardy's THE HEALING WARS: The fantasy trilogy you should be reading. PERSON 1: Read the first book, or maybe the first two, and wants to know if the last one is awesome. PERSON 3: Has zero interest in fantasy or upper-middle-grade fiction and isn't sure why they're reading this post. PERSON 1: Heck yes, DARKFALL is worth your time and money! The characters continue to develop, the plot thickens like no one's business, and the ending lives up to your expectations and then some. PERSON 2: This trilogy is well worth the read (even if, like me, you're not a big middle-grade or fantasy reader). Nya is a Shifter, someone who can heal by shifting pain from person to person.She’s hunted by those eager to exploit her ability for their own purposes, determined to make her a weapon, a killer, even a symbol for the war that’s brewing. All Nya wants is to protect her family and regain her people’s freedom, but the more she’s drawn into the plans of others, the more she realizes how key to everyone’s victory she really is. And how much she’ll have to sacrifice just to survive. A fantasy adventure for ages 10 and up, The Healing Wars trilogy follows Nya, a war orphan with the unique ability to heal—or destroy—with her touch. And here's five reasons why you should read it! If you're looking for a strong and smart heroine to root for, Nya's your girl. For years, life has handed her one struggle after another, and she has to make multiple heartbreaking choices throughout the books, but she keeps moving forward. The stakes are huge, and they're both personal and political. Entire cities are on the brink of destruction, and the lives of Nya's sister and friends are at risk -- with Nya (unintentionally) in the center of it all. The world of The Healing Wars is fantastically multilayered and realistic, and the concept of using healing and pain for political power makes this fantasy stand out from the rest. The plot twists and turns throughout the trilogy, with almost constant action, but it never veers into the realm of implausibility. These books are awesome. Seriously. They're that perfect mix of adventure with heart, intelligence, and depth, and I totally love Nya. Basically, you know it's a fantastic trilogy when my biggest complaint is that I wish there were fewer vowels in the character names. Not kidding. Go read them. Links: My reviews of The Shifter and Blue Fire. PERSON 3: Keep an open mind (and see above)! A huge thank you to HarperCollins/Balzer&Bray for sending me the ARC! I totally agree with your review. I'm a big fan of Janice and love her blog. 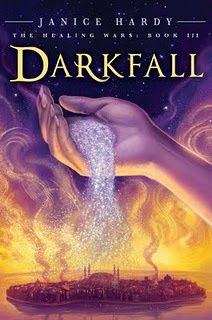 Darkfall was my favorite book in the series. I bought the first one based on the cover and was not disappointed. I'm not entering the contest because I'm giving away my ARC at Literary Rambles. Well, I have a copy of the arc, so don't enter me in the giveaway (but that IS generous of you!). And believe it or not, I've read and loved the first two books in the trilogy, but haven't yet gotten to the third! I know -- what am I waiting for? Hey, it's literally next on the stack! I'm actually Person 4--I've never heard of this series before, but wouldn't mind giving it a try. I've only read one other series about healers, but it was so well written and engaging, I've been trying to scrounge up any and all other books about healers to feed my habit!